For other ares we can deliver at a charge! NO Leash for rental, bring your own! Damage deposit of 100 US$ only in CASH is required and a copy of your passport if you take the board away from our beach. Jalan Cemara 4B. Just after the Puri Santrian Hotel. 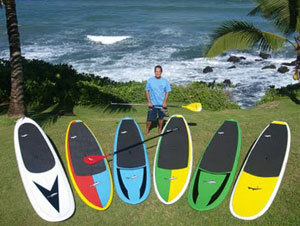 After pioneering Kitesurfing in Bali from 1999 and SUP in 2008 we are now moving in the Surfing Business. We offer SURF lessons and rental to help you learn this great sport. We supply SURF board for Beginners and Intermediate. Our ASI qualified instructors will give you their personal attention and share the surfing experience with you. Learning to surf could be the beginning of a new lifelong passion. We’ve dedicated time and energy to find the best surf instructors in Bali. Our staff of professional lifeguard and CPR certified instructors will educate you on the proper techniques. Plus with our top-of-the-line surf equipment, we guarantee you will be up on the board having a great time. At Sanur Surf School we give you the best tools to succeed in learn how to Surf. 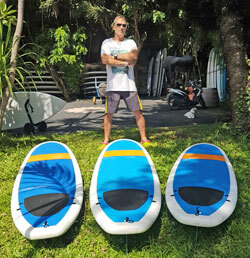 After a long study and in collaboration with Mr. Yanto a Balinese Shaper we came to the conclusion that Soft Top Surf boards are the best to learn with. We have custom made boards with extra volume to make it easy to catch your first waves. Side biters fins are rubber for safety but center fin is a proper Resin Surf fin to give you better speed and turning. 2.5 hours - 450.000 Rp P.P. Look no further! You found the best surf school for group surf lessons. All you have to do is bring a towel and a swimsuit. We take care of the rest so you enjoy the waves in sunny Bali. Plus, with our 4:1 student to instructor ratio (the best in the Island) you can feel confident that you will receive a safe, high quality lesson. 2.5 hours - 600.000 Rp P.P. Our semi private lessons are perfect for couples. 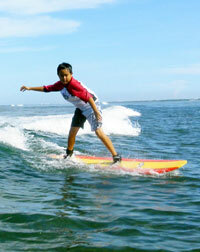 You will be separated from other group’s surfing lesson and exclusively handled by one instructor. It would only be you, your partner, and our professional instructor in this semi private surfing lesson. The SSS fan favorite! This is a best way to start surfing if you want to get personalized attention. Surf technique will be customized to suit your needs and abilities. We recommend the private lesson for those who are serious about surfing and advancing their surf skills. Rent a board from us. Jump on our boat and in few minutes you will be in the Waves for 120 minutes of great fun! One of our Guide/Instructor will surf with you and give some tips while keeping an eye on you. Too lazy to paddle to the waves? Then jump in our traditional Jukung boat to the reef. Go and back for 75.000 rp P.P. Hyatt, baby Reef, Simzy, Oka. For Serangan (Turtle Island) price is 100.000 rp P.P. You want to rent the all boat and have it at disposal, only 500.000 rp up to 4 hours (up to 6-7 people).